You are part of the miracle God is looking for to help change the world. Right now — in the midst of your busy daily life — God stands ready to help you find your purpose. His hand is stretched out to you from across the water. All you need to do is be willing to take that first step out of the boat. 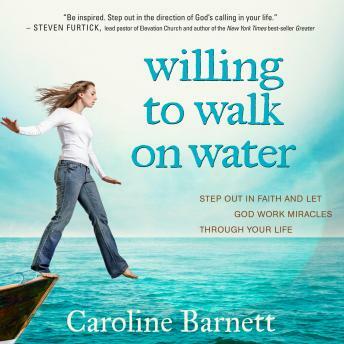 In Willing to Walk on Water, Caroline Barnett reveals that God created us to be happiest when we are doing the things we care about most — when we’re using our innate talents and passions to make the lives of those around us better. Drawing on her experiences at the Dream Center — a ministry full of unlikely miracles in inner-city Los Angeles — Caroline helps you find your “trigger,” the specific need in your world you can’t stand to see unmet any longer. She’ll show you how to act with your eyes and heart open to God’s leading, and to balance your dreams of making a difference with your everyday responsibilities. Give God your willingness and He will give you a reignited passion for life. Take that first step toward Him; you’ll find the water beneath your feet is as firm as solid ground.